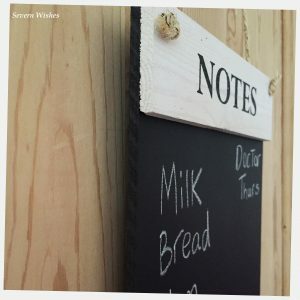 I’ve wanted a kitchen notes board for quite some time, but I wanted to be sure of the quality I was getting. I didn’t want to settle for anything and wanted to ensure it would last me many years of use. So when I came across Chalkboards UK on Twitter, a Midlands based company, I decided to contact them explaining what I was after. 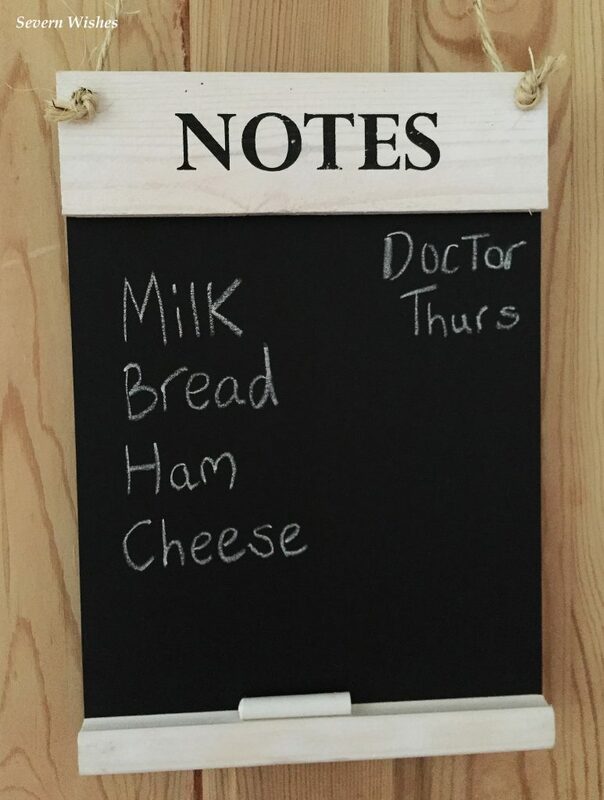 Luckily they were more than accommodating and did a wonderful chalkboard that sounded the perfect size for my little kitchen. In exchange for a review I’ve been sent this wonderful product. 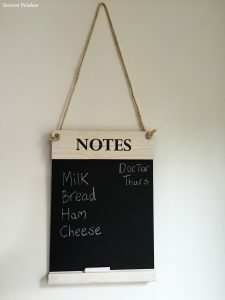 https://www.chalkboardsuk.co.uk/ are a company based in Stourbridge in the West Midlands. 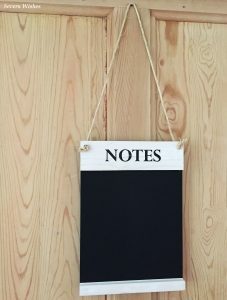 Part of the Porter and Woodman group, they specialise in designing and manufacturing chalkboards of all shapes and sizes. These can be purchased for businesses and industry or for home use purposes. The board came wrapped up to make sure it wasn’t damaged in transit, and was professionally packaged to ensure it arrived in one piece. Not only that but it was sent by a courier which told me within an hour when the item would be delivered. I wish all companies took this amount of time and effort with their products. With all this attention to detail the chalkboard arrived in perfect condition. So what I noticed first of all was the quality of the board. The item is very well made and the detail that has been undertaken is excellent. 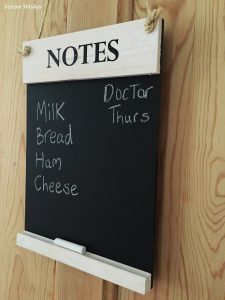 Chalkboards UK sell a variety of sizes and various titled boards. This one simply reads ‘Notes’ which is perfect for my needs, but they make others which have different headings and titles. 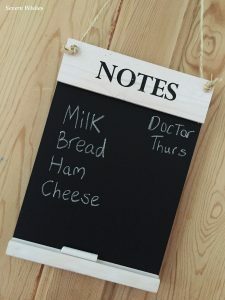 It’s a versatile chalkboard that is easy to write on and easy to clean, simply a wet cloth followed by a dry one gets it looking like new within seconds. A chalkboard is an addition every house should have. Another great thing about this board is how light it is. I was surprised it wasn’t heavier considering it was A4 size, but the weight made hanging it far easier than I imagined. The board hangs from rope and has a wonderful ledge at the base for the piece of chalk to sit on when not in use. 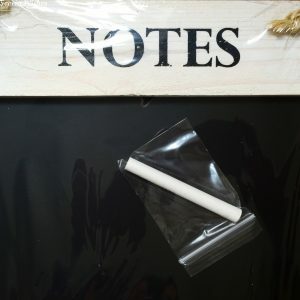 The size is perfect for writing large lettered notes or long lists if you can manage small handwriting with the piece of chalk. 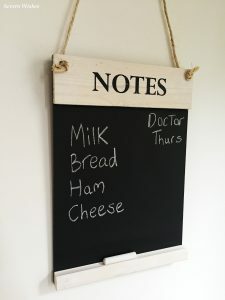 Chalkboards such as this one can be hung up anywhere with the ease of the string. I photographed mine on the wooden kitchen door as well as on the wall, before deciding where to hang mine permanently. It looked great in both places because of the white and black finish, it can easily be an addition to all sorts of kitchens. This board can also stand up if leaned against a flat surface. 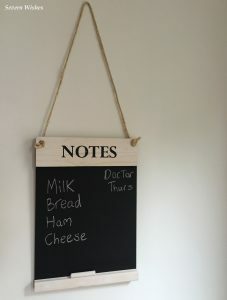 Thank you to Chalkboards UK for allowing me to review this wonderful product, I will not only be recommending you within my blog but within my personal life as well. And I couldn’t imagine not having my chalkboard up in my kitchen now, you have given me a missing piece of my home life puzzle. This entry was posted in Chalkboards UK, Homeware, Lifestyle, Reviews by Sabrina. Bookmark the permalink.